Architecture Is Fun captured the spirit of Brownsville and created a space that works beautifully. 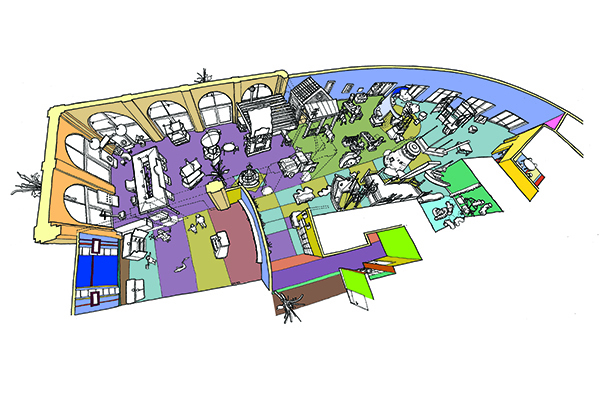 The design and layout of the museum flow effortlessly, encouraging learning, all the while making it great fun. Sharon and Peter did not miss a single thing…the museum floor, reception, offices and facilities are all beautiful and relevant. Their work puts children in charge of their own experiences in safe, efficient, and appropriate spaces. 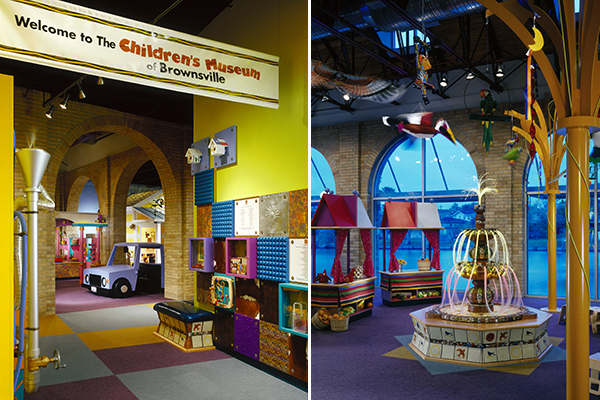 The Children’s Museum of Brownsville is its own border town, a destination for learning, playfully bringing together Mexican and American culture, history and lore. Its design reflects the sunshine and beauty of its Resaca environs, while responding to critical education and health issues arising from its active and porous border along the Rio Grande. El Primero Mercado, the marketplace, is the heart of the museum, celebrating the local spirit of buying and selling with its regional look and use of indigenous materials. Children creatively use the movable Vendadores, traveling carts, for face-painting and staging puppet shows. The traditional fountain is lush and lyrical, with local artifacts, mosaic and scrabble tiles lining its tiered shape. It reminds young visitors of how precious water is in this region using fiber optics to produce its radiant flow. Marking the marketplace perimeter are Bell Trees, metal cutouts planted in and out-of-doors, which hold captivating chimes and mache de papel birds. The palette derives from regional color, inspired by the river and the earth. Materials and finishes cross borders too; the sensorial Tac-Tiles that run along the museum walls are comprised of squares of pressed tin, tooled leather, hand-painted birdhouses, and handcrafted tiles. 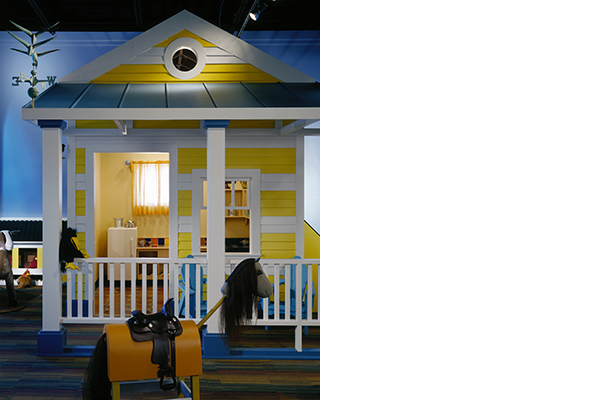 All around the museum are opportunities to role-play in themed zones, from the family farm to the folk-tale inspired Sea Serpent Infant Zone. The medical role-play zone promotes healthy practices. Children become doctors and nurses, brushing oversized teeth, taking temperatures, and giving immunizations. The All-Worlds Restaurant teaches children about diverse diets and nutrition with its farm-grown Texas oranges and valley grapefruits. At the adjacent farm, children plant and pick ripe fruit, loading the pickup truck for daily restaurant delivery. Concepts for the core exhibits stem from collaborative design with children and the community. Dance With Me highlights multicultural dances and the Little Isabella Lighthouse is modeled after the local beacon, but patterned with tiles of visitor’s handprints. 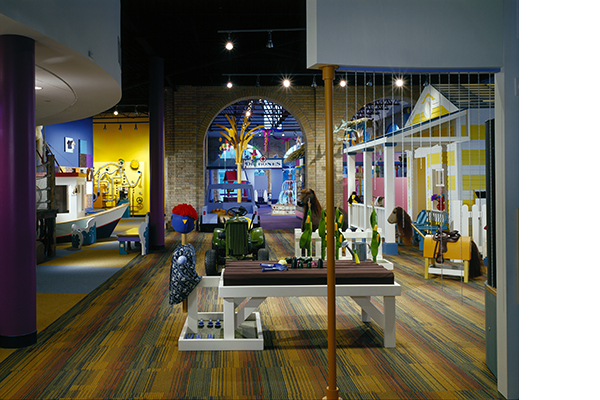 As an educational frontier, the design of the children’s museum blends the diversity of its bi-cultural community with educational messages through play and with pride. I think it’s just amazing. Truly wonderful for the people of Brownsville. 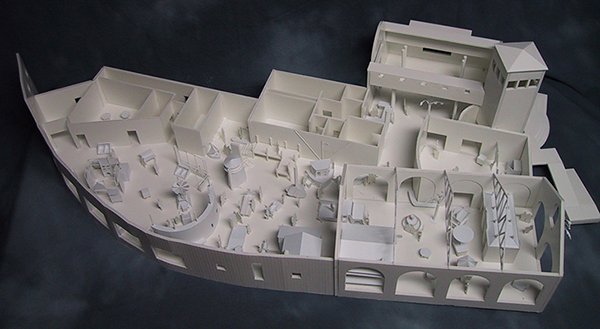 Interior Architecture, Exhibit Design & Interpretive Programming: Architecture Is Fun, Inc.